Premier logistics services provider Mitchell Cotts will undertake a capacity expansion programme at one of the Jomo Kenyatta International Airport terminals (JKIA). With the help of ACUNIS, the company has commissioned the construction of a new cargo terminal for perishables and dry cargo. The facility will see delivery of the 9,000 m² terminal’s scheduled completion sometime in September 2018 and an intended maximization of its annual throughput from 80,000 tons to a whopping 150,000 tons per year. Globally networked ACUNIS is a leading international provider of turn-key intralogistics solutions for air cargo terminals and is a joint venture between Unitechnik Systems GmbH and AMOVA GmbH and bundles the expertise of both companies in air cargo logistics. When completed, the new cargo terminal at JKIA will allow Mitchell Cotts clients to expand import and export of different types of commodities as well as perishable goods such as fruit, vegetables and spices even faster and more efficiently in the future. A major challenge that faced the construction design of the new terminal was integrating all of the required areas such as warehouse space and break rooms/communal areas, as well as customs clearance in the relatively dense overall available space. The resulting solution has been to foresee dividing the facility into two separate storage areas with virtually identical layout; one for dry goods and another for perishables. The latter is installed in a cold storage warehouse that is capable of regulating temperatures down to 2°C. 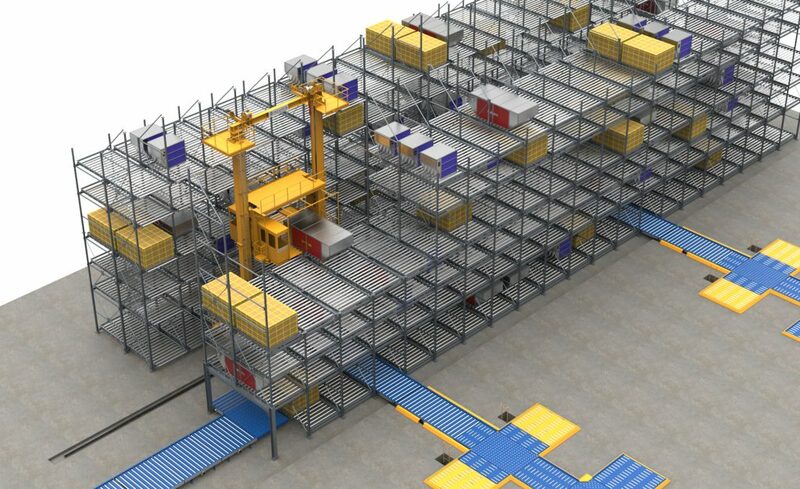 Each storage area will include a High-Bay Store (HBS), a Euro pallet store, a small parts warehouse as well as a section for bulky goods. Air cargo containers (Unit Load Devices – ULD) measuring up to 15 feet and weighing a maximum of 6.8 tons are stocked in the HBS. To use the existing space optimally, the HBS is offset so that it is three levels high on the land side and four levels high on the air side. Two elevating transfer vehicles (ETV) from ACUNIS will be used to store and retrieve ULDs at heights of up to 10 meters. As an air cargo specialist, ACUNIS is also supplying the conveying and handling systems for completion of the terminal’s interior, such as: roller conveyors, industrial trucks, work stations as well as loading and unloading bridges for trucks. The tried and tested warehouse management system UniWare will handle storage management. The software constantly tracks all manual and automatic warehouse zones and controls the movement of goods in receipt, warehouse, build-up and break-down. UniWare directly records ULDs when they arrive at the cargo terminal and tracks them throughout the entire freight-flow through the facility; while staging freight containers for the next flight guarantees rapidly load the cargo planes. At any time, a detailed overview of the entire plant and the flow of goods in the facility can be visualized by the aid of the infinitely variable zoom option in UniWare. ACUNIS specializes in the planning and engineering of air cargo terminals and was established in 2015 by a cooperation of branch specialists Unitechnik and AMOVA. The new cargo terminal in Kenya is the second project the joint venture has built in continent. Currently, ACUNIS is also working on building Africa’s largest cargo terminal for Ethiopian Airlines at their Addis Ababa Airport.